"It's a marathon not a sprint" etc., but the point (and even more importantly the performance) is a big step towards continuing the momentum of last season and it's not often a team comes away from Stamford Bridge having had the better of the chances. 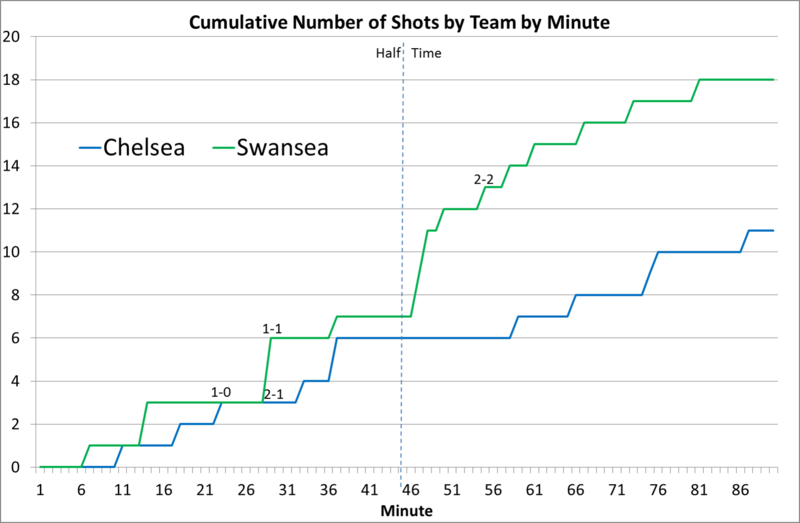 Although the Penalty incident resulted in a red card and the equaliser and maybe curbed Chelsea's threat from there in, the majority of the chances had come from Swansea before that anyway. 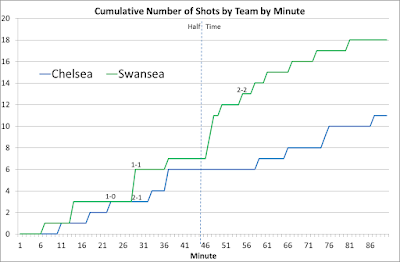 In 38 league games last season, Swansea only had 18+ shots in 4 games and 2 of these were against QPR so this (even if just 1 game) was quite a change from last season - even if 3 of the shots came in a matter of seconds as part of Ayew's goal. It wasn't exactly cutting edge insight but on the morning of the game I'd tweeted about how many of Ayew's goals seemed to be tap ins or from rebounds or saves off the keeper. There comes a point where it's a case of anticipation, judgement and general fitness to be able to be in the right place at the right time rather than being a 'lucky goalhanger' as probably 6 or 7 of his 10 league goals last season came from close in finishes without a keeper to beat. One of the most noticeable aspects of the game was the number of times big gaps seemed to open up in the middle of the pitch (one such incident led to a drive upfield from Ki ending in his hamstring strain), possibly due to Matic being over-exposed in this area. 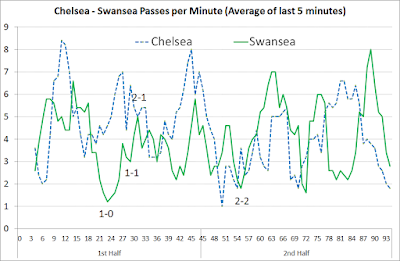 It was a surprise for Cork to be left out but this did result in Swansea's approach being 'attack is the best form of defence' which worked superbly. Average Pass Volumes per minute - Averaged over 5 min periods. 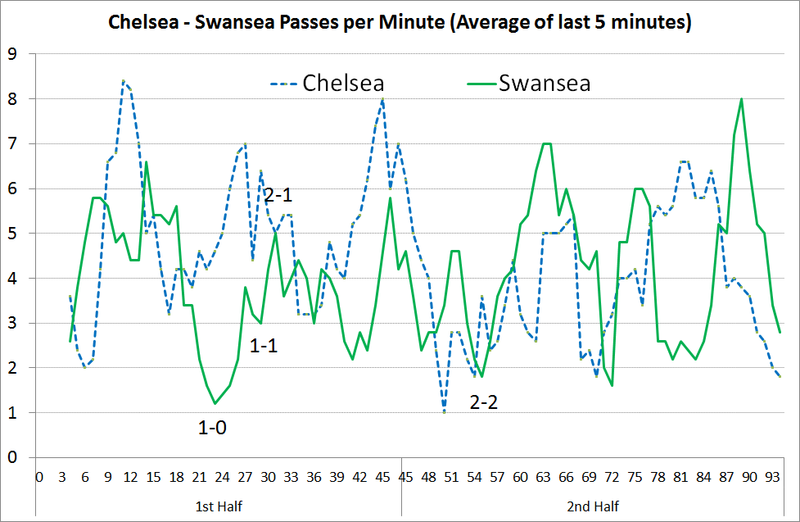 Chelsea with 2-3 periods of control in the first half but then only a brief spell towards end of 2nd half (obviously impacted in part by being down to 10 men). The obvious other highlight was Montero's performance, in particular a 5-10 minute spell early on in the second half (although his first take-on of the match was actually after just 6 seconds which was a sign of things to come). Montero's explosive pace and acceleration mean that injury risks are always there, one comparison (showing my age) could be with the 110m hurdler turned Rugby Union hurdler Nigel Walker who was on a different level speed wise to those around him but often gained niggling injuries which kept him out for periods at a time. To save me time, if you're after some more chalkboards from the game, the FourFourTwo Statszone review of the match is pretty good this week looking at Montero/Shelvey among other areas.